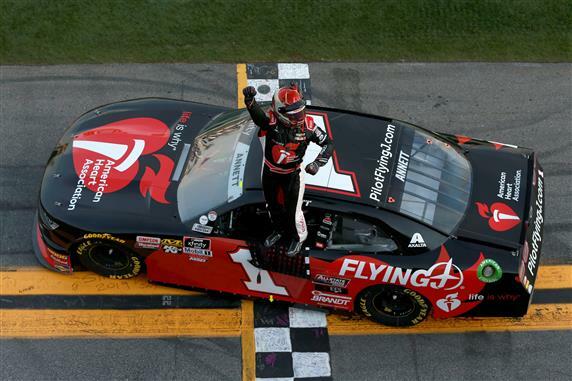 DAYTONA BEACH, Fla. – After eight years of trying, Michael Annett raced to his first Xfinity Series-career victory, coming in the NASCAR Racing Experience 300 at the Daytona International Speedway on a sunny Saturday afternoon. Taking the lead on the 76th lap, the Iowa native led the final 45 laps in the Pilot Flying J/American Heart Association Chevrolet. The car is owned by the Junior Motorsports powerful team, giving the team its sixth victory in the last 11 races on the high banks of Daytona. Teammate Justin Allgaier finished a close second but said while he desperately wanted to challenge, he couldn’t do so. He posted is eighth top-10 finish in 17 races at Daytona. Brandon Jones ended up third in a Toyota. Ryan Sieg fought hard to salvage fourth in a Chevrolet. His teammate Jeff Green motored to a solid seventh. Sandwiched between them were Austin Cindric and Christopher Bell. Rounding out the top-10 were John Hunter Nemechek, pole winner Tyler Reddick and Chase Elliott. After qualifications, Reddick had to replace a deflating tire, which sent him to the rear of the field. Jeffrey Earnhardt qualified second and led 29 laps before dropping back slightly to finish 15th in a JGR Toyota. Race favorite Brad Keselowski had an off-day when his roof flap came loose on the first lap. Team Penske crew made repeated attempts to fix the car but it didn’t work. He was scored 37th. From the outset, through Stages 1 and 2 and into the final Stage, the race was a follow- the-leader, single-file event but as the race wound down, the intensity picked up, to the delight of a sizable crowd. Justin Haley won the opening stage with a last lap pass and Ross Chastain took the second stage. Only four slowdowns occurred, consuming 19 laps.